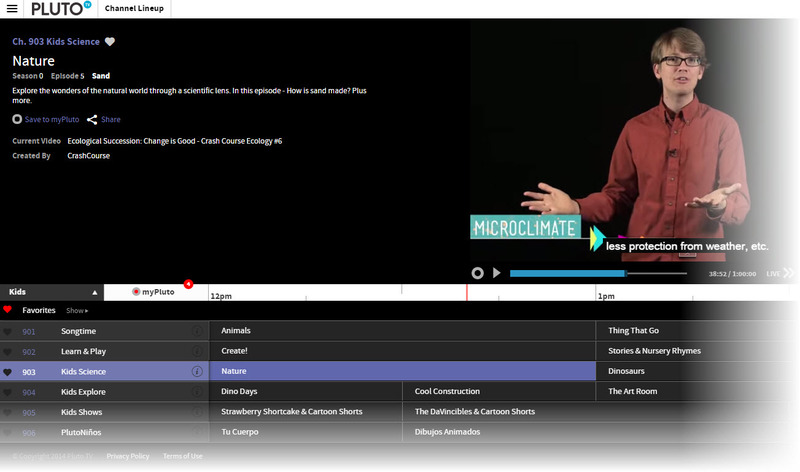 Where YouTube EDU uses an electronic discovery system to identify content, Pluto TV employs about 15 human beings who search for and curate videos. For parents, teachers, and children, the curation process is particularly important because each of the children’s channels (currently channels 901-906, click the “Channel Lineup” button on the top left) on Pluto are aimed at a different demographic, a very important feature that differs from television channels that may air content for preschool children in the morning and elementary-age children in the afternoon. Moreover, the curated content filters out shows on popular channels that don’t always deliver the educational or useful content parents expect. There is also a Kid’s Mode with a parent lock feature. Shows can be saved for future viewing or a reminder sent that a show is about to air. The interface is a familiar one that looks like the channel line-up on your television service provider. Each show plays at a specific time and it is possible to save a show or set up a reminder to watch it later. Of course, Pluto is well-designed to work on multiple devices and there is an app to improve the experience, as well. Learn more about Pluto here.